I’m finally back at sewing on my own projects. The backlog of customer quilts that accumulated while my machine was out being repaired are almost all caught up. I think there might be four left that have been here over 3 months. That feels so good to have all of those quilts done. I’m not sure how many there were, and I don’t think I want to know, either. I’ve been working on Sisters Across the Miles. The centre section of the top is now all sewn together. There are a lot of seams in there to match up and then press. Today I started cutting and piecing the borders. The top and bottom border units are done. It’s a blurry picture but it will have to do, for now. I’m taking a break for supper, and then I’ll head back up and finish off the side borders. All that will remain are the corner blocks and then sewing all the borders on. It is so close to being done, which is so very exciting! I’m hoping to get it quilted up within the month, get my son to do some professional photos of it, and then it will be ready for its publishing debut as a pattern! I’m linking up to The Canadian Needle and Thread Network and to Lorna’s Let’s Bee Social. Another two weeks have gone by, and I have a little bit of progress to show on the hand stitching project. It’s been a gorgeous day here, and I’ve spent most of it sitting on my swing, happily stitching away. I’m working on the last of the hexagons to go into the centre section of this piece, and then I can decide on what to do about going further. 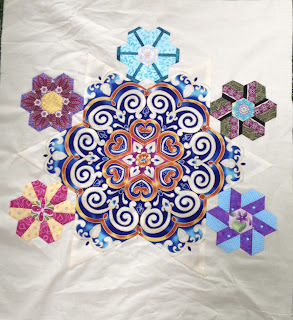 I want a narrow border of some sort, and then a wider cream border for more of the pieced hexagons. There is a border stripe print up in my studio that has some butterflies that might be interesting there. Those might get cut this coming week. I’m also considering adding some fussy cut triangles to the points of the large star. It seems to me that there is too much beige blank space there. I’ll have to get them done and lay them out to see, but not at this moment in time. I had some fabric arrive this week, so my stash added numbers have gone up and have put me into negative numbers, for a bit. 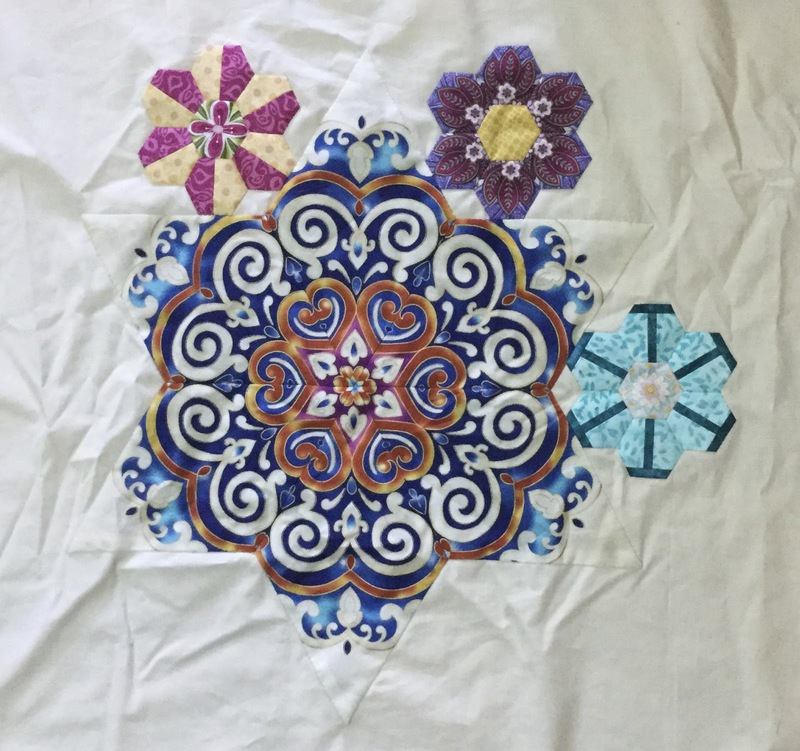 I’m going to be doing some backings in the next week or two, for some projects of my own that need quilting, so that will get the numbers back where I want them again. I’m linking up to Kathy’s Slow Sunday Stitching. It’s her fourth anniversary of the beginning of this link up series. It’s grown quite a bit in those four years, and the hand work on display each year is astounding. I’m also linking up to Judy’s Stash Report. Then it will be time to head indoors. There are thunderstorms headed our way. Life continues to accelerate at the speed of sound around here. I’m getting lots of customer quilts done...... over ten since my machine came back home. But that means that very little of my own stuff is getting done, which means not much interesting is happening to document on the blog here. I am getting knitting done and some hand stitching, and that’s about it. The other thing that is getting done, though, is a lot of research on internet sales of my quilt patterns. Who knew it would be so complicated? Turns out, if someone in a country in Europe wants to buy a digital download pattern from me, who lives in Canada, I am supposed to collect the tax that is owed in their country and submit it to either that country, or a central agency that distributes those taxes to the appropriate people. The research and the learning curves into how to do this, and the best way to sell is rather overwhelming. Should I go for an Etsy shop, then I can sell my patterns, and also some quilts. How about an account on Craftsy... I could sell my patterns there, but not quilts. Or there is the option to attach a shop right to my blog. So many choices, and no idea, at the moment at least, which to choose. So, in the meantime, I work on customer quilts, and also work on trying to get some of the patterns written up. And I knit to relax my brain. I’ve gotten a lot done on my Roads End sweater. I’m down into the contrast colour band around the waist. When I first started this sweater, I wasn’t 100% sure about the colour combinations. I mostly put them together because I had enough to make a sweater if I combined them, but not enough of each colour to make a full sweater. Plus, they are hand died yarns, so each skein is slightly different from the other, so stripes seemed a better idea. Now that I’m seeing it come together, I really like the combinations. I’m working, little by little, at my wall hanging that is using Karen Howes’ pieced hexagon techniques. It’s a slow process, which is why it’s slow Sunday stitching. It can’t be rushed or hurried. So in the process of doing it, my brain is forced to slow down, and enjoy the process. There are three more hexagon units to add around this star. Then I think it’s going to get a border of some sort, followed by a border of more pieced hexagons. Karen had a give away a few months back, and I won a choice of one of her pattern packs. I chose her Easier than Pie book 5. They are all printed out and ready to go. I’ve switched spots where I’m stitching today. Rather transiting in my trusty, comfy recliner beside the window, I’ve moved over to a glider rocker that is right beside the area where my husband paints. We’re working on our separate projects, but are close enough to chat, should we wish. There’s quiet worship music playing in the background and life is so very good! 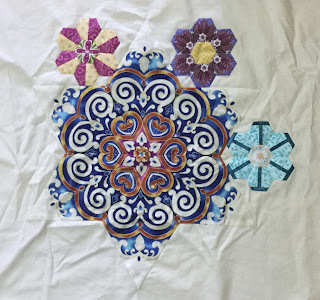 I’ve finished up the piecing for a quilt this past week, so this week I can count some of the blocks that hadn't yet been added to the stash report. It’s getting to be time for supper, so I’m going to link up to Kathy’s Slow Sunday Stitching and Judy’s Stash report and then go eat before doing some more stitching. I haven’t done a design wall Monday post in ages. 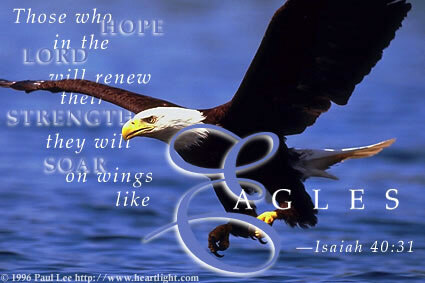 For some strange reason, Monday’s seem to fly by and it’s Wednesday before I even realize that Monday has happened. I’ve put my Sisters Across the Miles quilt back up on the wall. I’m wanting to put a push on to get this one finished. All of the alternate squares containing those blue quarter square triangles are done. There are 7 more of the Sister’s Choice blocks left, and then this can begin to be sewn together. I’m hoping to start releasing some of my quilt designs for sale as patterns, and there’s a good chance some of the quilts occupying space here could go up for sale as well. I’m hoping to either get a website going, or to somehow get a shopping cart/paypal hooked up to the blog. Our son’s girlfriend knows how to do this and has offered to help with it. She’s not available;e until July. 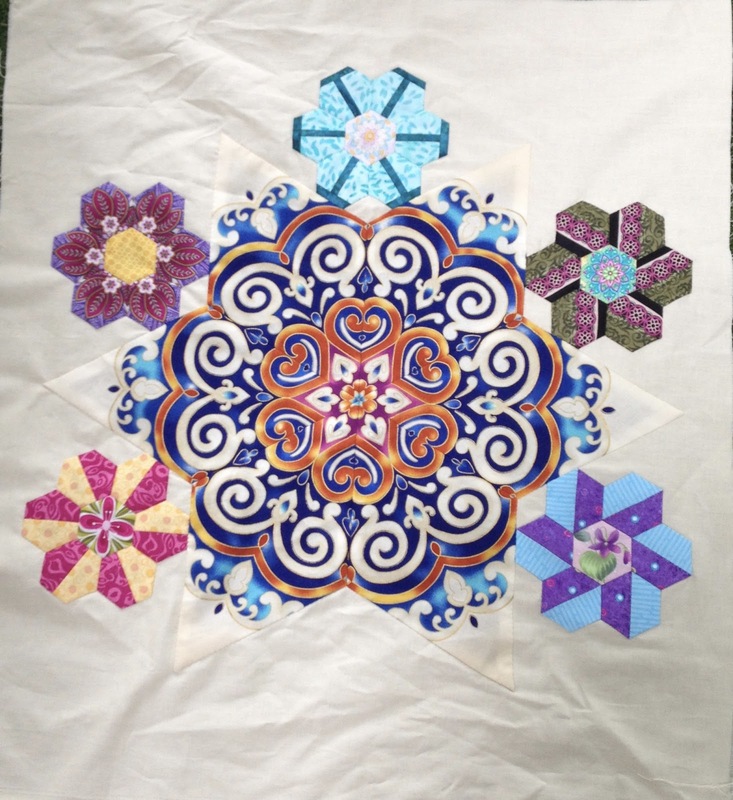 It would be nice to have this quilt finished and the pattern written up by then. In the meantime, I’ve been steadily working away at the pile of customer quilts that are here. I’m currently working on Charlene’s La Passacaglia. It should be done by the end of tomorrow afternoon. There’s a charity quilt that needs to go on after this one. Slowly but steadily working the pile down. I’m linking up to Judy’s Design Wall Monday. Then I think it might be time for some relaxing knitting. 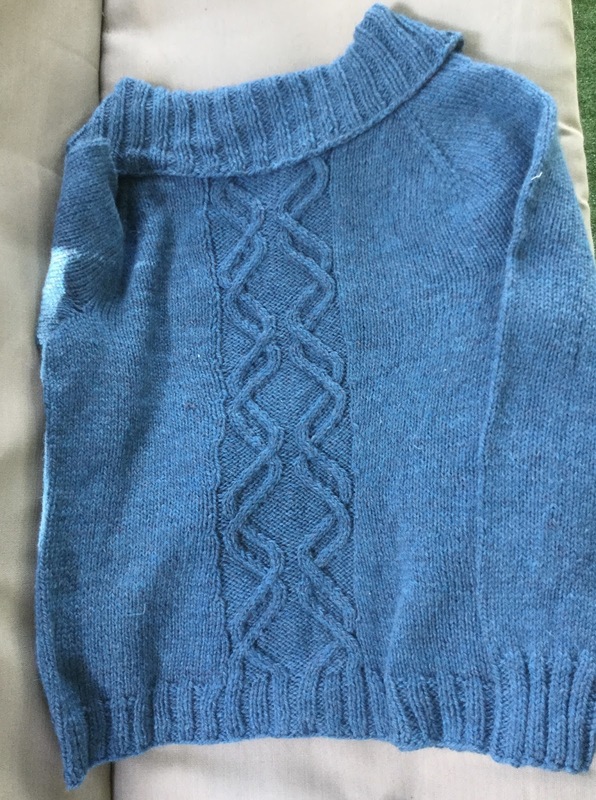 My Travellers End sweater is done. I took the last stitches in it on Tuesday, and then decided immediately to get the ends sewn in and get it blocked. I have a bad habit of procrastinating both those tasks, so I figured that I’d do them while I had the sweater still in my hands. 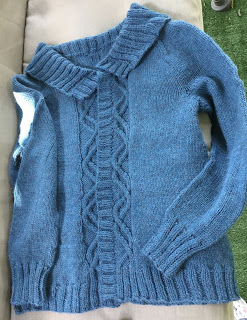 As of today, it is blocked and dried and now all it needs are buttons. Since that one is done, I decided right away to start another one. I found Roads End while surfing around the Ravelry website a while back. I have a small number of skeins of Malabrigo Rios in two different colours, not enough of either to make one sweater, but enough when combined. I’d been looking for a striped sweater pattern for a while. I really like the textured areas in this one. 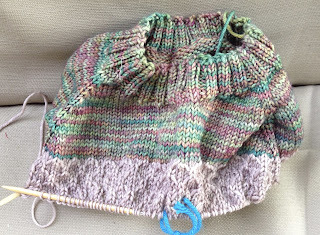 I cast on for this one last night, and have most of the ribbing for the neckline done. At this point I need to start paying attention to putting in stitch markers and counting for increases, so I decided to set it aside until I was more alert than what I am at 11 o’clock at night. I had planned on doing mine in just two colours, but while in a cute little yarn shop yesterday, buying double pointed size 4mm needles, I found a dark contrast colour that contrasts perfectly with the other two. So, here are the three colours. What’s so kinda cool about this is that the dark burgundy on the right is from an independent dyer called Lichen and Lace in Sackville New Brunswick, so I can support Canadian made goods. I’m going to have to check out some of their other stuff at some point. I’m linking up to Judy’s On the needles.